Out went the GT1 racer's steel skeleton and carbon brakes, and in came the C6 ZR1 's hydroformed aluminum frame and body styling, an aerodynamic package that included a smaller front splitter and rear wing, and a race-prepared 485-bhp 5.5-liter GM V8 that shared its architecture with the Corvette C6 Z06's LS7 powerplant.The C6.R GT2's first full year of competition yielded victory at Petit Le Mans in the American Le Mans Series' 2010 season finale and fourth place in the final team standings—a solid base on which to build a whole new racing dynasty. Please share your reviews, videos, pictures, or critiques about the C6R in the comment section. And be sure to check back regularly to read our very own Simraceway staff give you some insight into the creation of our high-performance workhorse. Very nice car to drive. The auto clutch is really bad for standing starts, always turn it off at least for the start. The car looks pretty good, the only think I don't like about it is the tinted windows. Even if the real car has tinted windows it's because it's there to cut down on some of the sun glare on bright sunny days, but since we don't get that problem on a monitor, there is know real need for it, it just makes the view a lot darker than it would be in real life and doesn't look realistic. The shots below show how dull the view is. If the windows were made clear it would make a big difference. Yeah the auto-clutch is pretty bad. The default gearing is also bad. Top speed 120mph? After some tweaking I have what I think is a good starting point. I tested on Watkins Glen. Your car is pending an update, which will cover the default setup. I don't have the ETA for it at the moment, so meanwhile will provide you with a setup that we used in several events. You will recognize it the moment you try it. Let me know if you will have any troubles loading it. I make a video for this car Tell me what you think! As I see it - the dark windshield does not go in 1st gear and the clutch is very bad. The car is understeering heavily and is almost impassable after 3 rounds. So sehe ich das auch - die dunkle Windschutzscheibe geht gar nicht und die Kupplung im 1.Gang ist sehr mies. Das Auto untersteuert stark und ist nach 3 Runden fast unfahrbar. I've never had a problem with it going in 1st gear personally. Yes it does understeer but once you know that just drive it accordingly, though if it was in an Expert event I would probably loosen it up a bit. 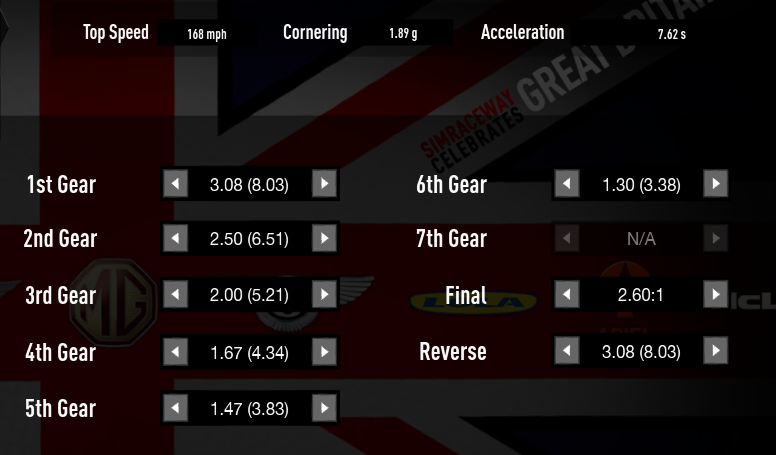 Setups used in recent Test Drive Tuesday Quick Races are below. All three have the lowest ratio of 1st gear possible to help moving it off the line. Almost all of the C6 electronic parts are manufactured in China.